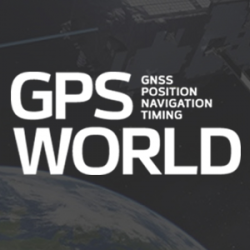 Global navigation satellite system (GNSS) technology found its way into products ranging from autonomous vehicles to wearables at this year’s Mobile World Congress in Barcelona, Spain. One company says it is tailoring a GNSS receiver chip to meet the demands of mobile devices that require high levels of speed and position accuracy. Thalwil, Switzerland-based u-blox said its new low-power UBX-M8230-CT GNSS receiver chip can not only be used for smartwatch development, but for tracking people, animals and assets. Bousquet said the chip, in what the company calls a Super-E mode, uses GPS with either GLONASS or BeiDou. This mode allows batching location data on the chip, which reduces power consumption, he said. Bousquet said the chip is available now, in an evaluation kit, for around $120. He said the chip will be manufactured in volume this summer. Another company, Racelogic, exhibited its LabSat 3 Wideband GNSS simulator, which is used by u-blox and others to help test and develop products. Some applications include drones, autonomous vehicles, survey equipment, personal monitoring devices, aerospace and end-of-the-line product testing, the company said. The newer L2C, L5 and L1C signals give companies the opportunity to develop products that are compatible with new receivers as they come to market, said Mark Sampson, LabSat product/sales manager. 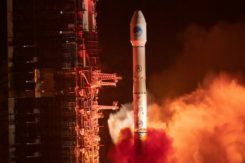 The company also showed off its SatGen v3 simulator software that allows users to create a data file to be replayed on the LabSat GNSS simulator. The software allows companies to define a complicated route, and then import it into the software. 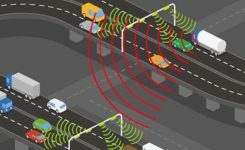 Both the European Union (EU) and Russian Federation are requiring governments to have intelligent telematics-based safety systems. In case of a serious accident, these systems automatically call for local medical services. Technology to meet the requirements of eCall and ERA-GLONASS include an antenna, GNSS receiver, crash sensors and other components. To reproduce end-to-end and standard-compliant testing of the eCall and ERA-GLONASS modules, Rohde & Schwarz offers two products. One is the CMW-KA094 eCall application software. The other is the CMW-KA095 extension for ERA-GLONASS to simulate a public safety answering point (PSAP) to emulate a cellular network in a lab. “It’s pretty important testing because of the safety of life. We have set up implementation of it in our labs,” said Christian Hof, Rohde & Schwarz senior product manager for mobile radio testers. During testing, governments and companies can use the CMW500 platform, which identifies Internet of Things (IoT) and mobile communications devices’ IP connection security issues, Hof said. The company believes, since many IoT platforms are proprietary as standardization is still in progress, security gaps are frequently reported. Spirent Communications displayed its Elevate IoT Device Test Solution, a new cellular test designed to support IoT applications. These applications include end-to-end cloud server connectivity, security-vulnerability assessment and battery-life measurement. The new unit is available through the company’s Spirent Elevate platform, which addresses areas affected when designing 3G, LTE and new narrowband wireless technologies for IoT devices. Overall, Spirent is finding many use cases and applications in the IoT and mobile industry. Not everything is about drab simulation. Far from it. Spirent last year teamed with Aston Martin Racing to evaluate automotive technologies on the 2016 V8 Vantage GTE race cars. This includes the accuracy and performance of GPS receivers and interference monitoring, said Julian Kemp, Spirent product manager, custom solutions. Taoglas is offering GNSS antennas that support IoT products, unmanned aerial vehicles (UAVs) and future autonomous vehicles, said Ronan Quinlan, company co-founder. The company is offering lightweight antennas for mass-market unmanned UAVs, which had a growing presence at Mobile World Congress this year. The future markets for Taoglas will be in connected and autonomous vehicles, Quinlan said. “We found out years ago that we missed out on the rise of 2G, but we did not miss the rise of 4G. The advent of 5G and GNSS will lead to the development of the autonomous vehicle,” he said. Antenna costs associated with the rise of autonomous vehicles will have to be reduced, Quinlan said. “Some antennas that were $100 solutions have to go down to $20 solutions once they get into a car,” he said. Fraunhofer IIS displayed its Enhanced Voice Services (EVS), the Third Generation Partnership Project (3GPP) communication protocol designed specifically for voice over LTE (VoLTE) services. Telit said it is expanding its relationship with Tele2 on Pan-European long-term evolution (LTE) IoT connectivity services. Telit and Tele2 now offer custom data plans with predictable pricing, no hidden fees or roaming charges for high bandwidth IoT applications, the company said. Services include video monitoring, digital signage or real-time asset tracking.